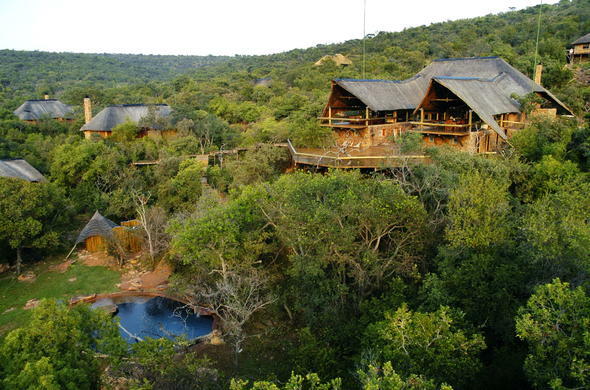 Sediba Game Lodge is a grand spacious safari lodge with views to match. Everything about Sediba is expansive, from its enormous wooden doors to its colossal bedrooms and dance hall-sized wooden decks. The furnishings encompass cutting edge customized styles and designs with Zen and ethnic influences. The suggestion is of a time and place that is not the guest's own, bestowing a degree of separation from the pressures of ordinary life, creating an atmosphere of absolute calm and tranquility. Sediba is situated in the rolling wooded hills of the Welgevonden Game Reserve, only 3½ hours drive north of Johannesburg. This is a malaria-free reserve and contains Africa's majestic Big Five animals. Sediba offers accommodation in a choice of 16 suites, including a universally accessible. No luxuries have been spared at Sediba and this will surely be the biggest and most comfortable you have ever slept in. Privacy is paramount so you have your own outdoor jacuzzi and plunge pool and should you so desire, you may have a massage in your own suite.